This has been my teacher prep-planning week. The kids have each been in camp Monday-Thursday (9-12), so this gives me the solid time I need to clean out school areas, arrange books, and start working in my planner. Anna has done a week of tennis camp, and Grant a week of baseball camp. Needless to say, everyone is very tired at night and the house has been quiet. My approach to planning has been much more laid back in the past. With a seventh grader this year I need to be more diligent about planning. I also feel our year will run more smoothly if I invest this time up front. 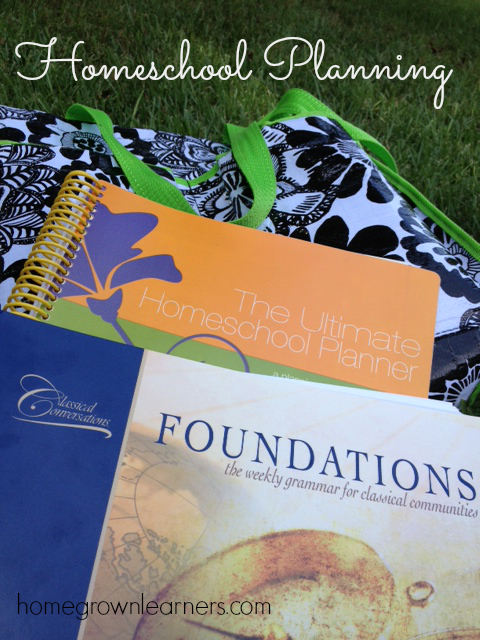 The Ultimate Homeschool Planner - I am using the planner for moms and also have the student planner for Anna. I love this system and am hopeful I will be able to keep up with this. It's simple and easy. Classical Conversations Foundations Guide - This will be my homeschool Bible this year for Grant. With each week laid out specifically I can transfer ideas to my planner and add supplemental activities. *Planning for Anna is underway, too. We have a Challenge parent meeting tonight (Thursday at the time of this writing) and will find out more and get her guide then, too. It feels very good to have so much planned for me already. Theology is the mistress of all other studies. Yes. I want my children to see God in everything and know that everything points back to God. I am so very excited about this year. Every summer we attend a family reunion. Generations ago there were 13 children in the Earnest family - now, each of those children's children and grandchildren, etc... gather for a large reunion each summer. We sign in at the reunion on a sheet according to which sibling we belong to. This is my husband's side of the family. I used to not enjoy the reunions and actually dreaded going,(I am ashamed to admit this.) but as I have gotten older I have appreciated them more and always have a good time. Family is important. It's everything, really. As we walked into the reunion this year Grant noticed a game of No Stress Chess set up on one of the tables. Right away he was very excited that there was another chess player attending. Upon talking more with them - yes - they were homeschooled. I met their mother (who is a distant cousin of my husband's) and we had such a nice conversation and so much in common. The kids enjoyed each other and it turned out to be such a neat connection for all of us. Homeschoolers just stick out, don't they? And not in a bad way - quite the contrary. Anna also made a new little friend - a second cousin of hers from California. What a little cutie. Craziness. But oh so good. In between planning there was a lot of living going on. I love looking back on our weeks and seeing just how very blessed we are. 1. A sweet reader recommended The River to me last week. I ordered it -- it's an EXCELLENT book and will be the first book Anna will be reading for back to school. I can't wait to discuss it with her. It's story of faith, loss, and hope. It's perfect for your pre-teens, teens, and even YOU. I zoomed through the book in three days. 2. Grant's baseball camp is a favorite of his. He went one other week this summer. His coach this week was wonderful and it was a small group of kids. Grant thinks it's funny because the coach (instead of calling them boys and girls) calls them "Dudes and Chicks". Grant's week has been pretty much perfect. 3. Grant heading to baseball camp. 4. Anna heading to tennis camp. 5. Anna at the piano - my daughter LOVES her music. I snapped this shot of her practicing one evening. I don't recall loving music this much at her age or practicing this much, either. I am so thankful for this anchor in her life. 6. Lots of drawing went on this week using Art for Kids. Do you know about this site? It's awesome! 7. Grant's Minion drawing was featured on the Arts for Kids Facebook page. Woohoo! Lots of deals to share with you since back to school is upon us. Notebooking Pages is having a back to school sale - August 1-15. August 1-2 you can also get $25 off your membership. This is a good deal! This weeks eBook bundle of the week is all about homeschooling. Snag these 5 great books (one of them is Notebooking Success from my friend Jimmie!) for $7.40. This is also a very good deal! Finally, my SQUILT music appreciation curriculum (Volume 1: Baroque Composers) is on sale through August 2 for just $4.99. That's only $.50/week for a 10 week music appreciation curriculum course where you don't have to do any work - it's for the mom with little or no musical knowledge! Snap Circuits are STILL on sale at Amazon. We LOVE them! I think that's it for this week. Next week starts bright and early Monday with Anna getting her braces. I didn't think it would be nice to start school that very day, so our first official day of school will be next Wednesday. Have you started school yet? ** Please join me for Collage Friday! Share your photo collages from your homeschool week. I will delete any links that do not contain photo collages. Grab a button from my sidebar, or text link back to this post in some way. Visit other bloggers in the link-up to gain ideas and offer support. Our community is a wonderful way to make friends, educate ourselves, and see we are not alone in our struggles!